Found in Nicaragua. No English common name found; the above is my guess. Found in the United States and northern Mexico, with a relict population in Oaxaca and intergrades with praeocularis in Veracruz, Tabasco and Chiapas. This subspecies is found in the pet trade, where an albino form is popular. Found on the Yucatan Peninsula and in Belize, Guatemala and Honduras. This species is listed as threatened in Kansas. The Checkered Garter Snake is considered one of the best, if not the best, garter snake to keep in captivity, largely because of how easy it is to convert to a mouse-based diet. An albino form, pink and yellow with red eyes, is frequently bred. My own experience with this species has been somewhat more mixed. While I had no difficulties in converting the four snakes I’ve kept to mice — two tiny near-neonates we acquired took pinky pieces without hesitation and without scenting — they have not always been the best feeders and have sometimes refused meals, particularly in the fall. (I’ve had to resort to the reset button.) Nor has this been the tamest garter snake I have worked with: my specimens have tended to be shy and jumpy, and not at all comfortable being handled. In general, I’ve found Common, Western Terrestrial, Plains and even Butler’s garters more satisfying captives. But that might just be my own experience. Because of reports of cannibalism in this species, these snakes should not be housed collectively. One to a cage, please. Brown, Philip R. 1997. A Field Guide to Snakes of California . Houston: Gulf. Perlowin, David. 1994. The General Care and Maintenance of Garter Snakes and Water Snakes . Lakeside CA: Advanced Vivarium Systems. ———. 2005. Garter and Water Snakes . Irvine CA: Advanced Vivarium Systems. Sweeney, Roger. 1992. 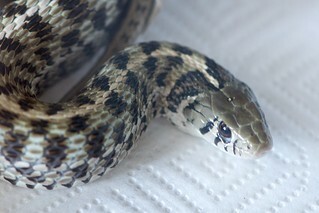 The Garter Snakes: Natural History and Care in Captivity . London: Blandford. Tennant, Alan. 1998. A Field Guide to Texas Snakes . 2nd ed. Houston: Gulf. ——— and R. D. Bartlett. 1999. Snakes of North America: Eastern and Central Regions . Houston: Gulf. Werler, John E. and James R. Dixon. 2000. Texas Snakes: Identification, Distribution, and Natural History . Austin: University of Texas Press.